On this release Google is pretty faster than others, yesterday in the Google I/O 2011 annual event they announced the new major update for Android devices and tablets which will solved the OS fragmentation issue and comes up with the amazing features. The new OS update for android mobile devices will roll out nearly in Q4 of this year and for tablets soon in some weeks. 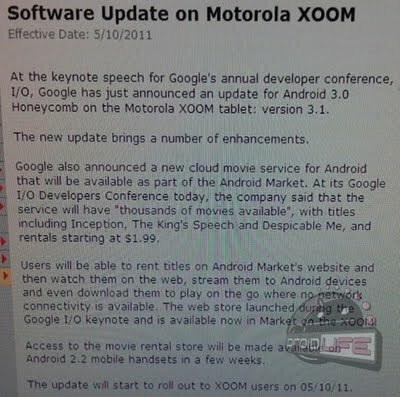 So just after a day of announcement Google immediately kick out the OS update of HoneyComb 3.1 and this update will firstly released for Motoralla Xoom users. 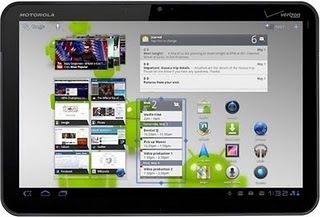 Google announced that Verizon will roll out the HoneyComb 3.1 update to Motorola Xoom 3G users. This update will provide you some handy features which allows you to connect keyboard, Mice, gaming controllers to your device easily via USB. and also provide you option to import pictures from your digital camera to your tablet directly. Also this update comes up with new designed video application which allows you to watch rental movies on your device and provide you facility of downloading movies from the Android Market. The rented movies can be stored for up to 30 days long if you did not start watching other wise you have to complete watching it by 24 hours once started.